I've been eating all-natural, predominantly organic food from the time I was in my early teens, and I find that this kind of food both tastes better and makes me feel better than conventional food. Recently I've been looking to incorporate even more variety and nutrition into my daily diet, so I was intrigued when I spotted The Nourished Kitchen by Jennifer MacGruther. 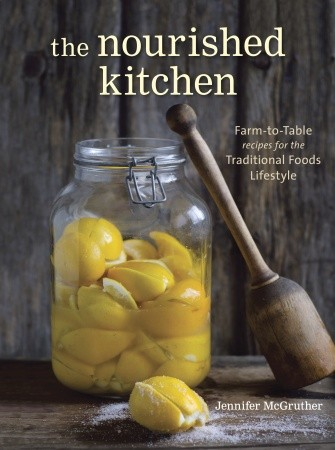 Part cookbook and part guidebook, The Nourished Kitchen takes a "traditional foods" approach that uses natural foods and a balance of vegetables, fruits, grains, dairy, meat, and fish. Since I value moderation and avoid chemicals and additives in my own diet, I thought that The Nourished Kitchen would be a good source of inspiration and information. The Nourished Kitchen begins with a brief introduction to its philosophy, information about research that informed this philosophy, and an overview of how the book approaches different food groups. After that, the book is divided into chapters focusing on a particular source of food: From the Garden (vegetables), From the Pasture (dairy), From the Range (meat and poultry), From the Waters (fish), From the Fields (grains, beans, and lentils), From the Wild (wild food), From the Orchard (fruits), and From the Larder (home-preserved foods). Each section contains numerous recipes as well as information on nutrition and food preparation in the forms of charts and articles. A glossary and shopping directory in the back of the book make useful resources for those new to natural foods. The recipes themselves are traditional in a northern European sense, with an emphasis on cultured dairy, a variety of grains, root vegetables, and fish. The dishes use relatively familiar ingredients and flavor combinations, erring on the side of good plain cooking, but a handful of recipes are a little more adventurous in their mixes of sweets, herbs, and spices. While the book is not intended for vegetarians, the vast majority of recipes in all chapters except From the Range and From the Waters would be suitable for vegetarians who eat dairy and eggs. Some recipes are also suitable for a vegan lifestyle, but the heavy use of eggs in particular makes adapting many of the recipes tricky for vegans. The Nourished Kitchen is an excellent practical resource for learning about and cooking natural foods, both for those who already eat organic food and those looking to transition away from conventional food. It's also a beautiful book, with many full-color, full-page photographs of food and rural scenery. The way of eating celebrated in The Nourished Kitchen is inspirational but still obtainable, making the book a great staple for those interested in the organic lifestyle. FTC disclaimer: I received this book for free from Blogging for Books for this review.